Pictured are Alan Mulcahy, sales director Energia and William Keeling, CEO, Food Central. Energia. 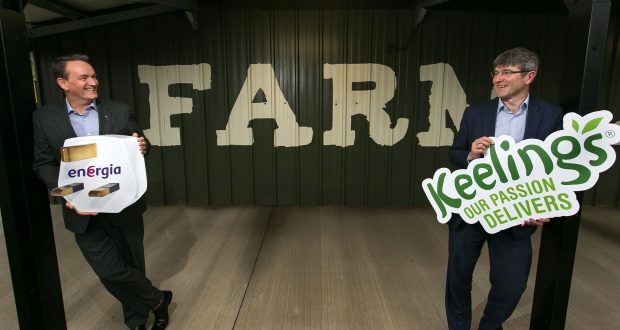 Energia has announced that it will supply power to Keelings, Ireland’s leading fresh fruit producer. Under the agreement, Energia expects to supply Keelings with 1.5 GW of electricity per annum across all of the fresh fruit producer’s sites. Energia has to date supplied insulation, cooling, lighting and burner solutions for Keelings. The supply agreement is expected to be worth approximately €370,000 per annum to Energia. Alan Mulcahy, sales director Energia commented; “We are delighted to announce our partnership with Keelings. Like Energia, Keelings is a business that serves communities all across Ireland, and is one that is committed to sustainably growing in the future to meet the needs of their Irish and international customers. We are looking forward to working with the Keelings team and support in the ambitions of this Irish success story”.